Young children have been told to stop playing on the roof of the former Lidl building in Lurgan or risk being injured or killed. 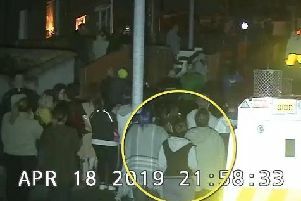 A member of the public took photos of the youths on the roof of the now derelict building in Castle Lane on Wednesday night. “A very vigilant member of the public has taken these photos and provided them to our office. Young kids climbing onto the roof off the old Lidl building in Castle Lane. “Parents please advise your kids not to engage in this dangerous activity. “The SDLP has spoken to the PSNI in relation to this to increase patrols in the area and we have also tried to speak to the letting agent CBRE, however, after leaving numerous voicemails with the relevant letting agent we have received no phonecall back to get the owner of the building to increase security on this site. Residents have said that anti-social behaviour has been ongoing in the Castle Lane and Windsor Avenue area regularly and particularly at the former Lidl site. There have been regular complaints of youths involved in alcohol abuse in the area.